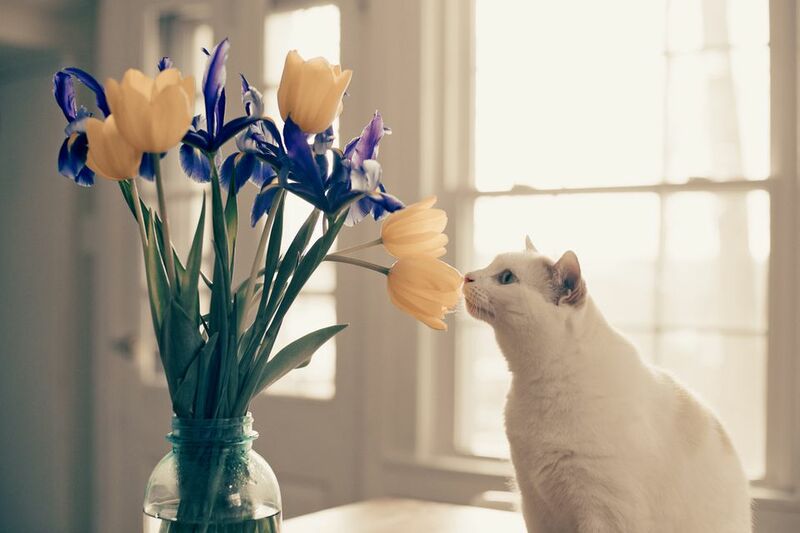 Did you know that a cat's sense of smell is 14 times stronger than a human's? That is because its total nasal organ is comparatively larger than that of a human. Cats depend on their sense of smell for their very survival; in fact, it could be said that a cat's nose is its most important organ. A cat uses scent to sniff out food, mates, enemies, and to seek out his own territory, which he has previously marked. It is easy then to see that the world of a cat is the world of scents and odors. To Smell Food: Right after birth, the blind kitten will use his sense of smell to locate his mother and to latch onto a teat. From then on, a cat's sense of smell will lead him to food, sometimes in the unlikeliest places. A cat with an active URI (upper respiratory infection), or an aging cat, may have a reduced sense of smell and go "off" his food (taste is associated with smell). You can help by warming the food slightly, to enhance its odor. To Locate a Mate: Female cats in heat (in their estrus cycle) exude a powerful sexual pheromone that can be scented by a male for great distances. If you've ever been entertained by choruses of lusting Tomcats outside your home while your unspayed female cat tries every means of escape, you'll appreciate this phenomenon. Female cats can also scent out a preferred mate by his territorial markings. Establishing Territorial Lines: Male cats mark their territory with urine or with pheromones from glands in their face and feet. They will travel their territorial boundaries frequently, sniffing at their markings, and reapplying when the odor diminishes. Other male cats will smell the markings and either respect the territory or attempt to take it over by introducing their own scent markings. Warn Against Enemies and Danger: Have you ever observed a cat entering the outdoors with head held alert, whiskers twitching, and nostrils wide open? He is sniffing out potential harm. Has another cat ventured by, and what was in that delivery truck that just left next door? His nose will tell him, along with its powerful accessory, the Jacobsen organ, described below. Cats (along with snakes and a few other mammals) have a magnificent organ called the vomeronasal organ, most often known as the Jacobson's organ. It is located at the mouth, just behind the front teeth, and connects to the nasal cavity. Opening his mouth slightly enables a cat's Jacobson's organ to open up the ducts connecting to the nasal cavity. The appearance of the cat as he brings air into the Jacobson's Organ has sometimes been likened to a "smile," other times to a grimace which is called the Flehman response. The Jacobson's organ seems to play a large part in the sense of smell of a cat, judging by its frequency of use around my house. A cat's nose leather may be either black or pink, depending on genetics and the cat's basic coloring. It is a pretty tough surface, probably from cats' propensity to stick their noses into places they shouldn't be. One caution should be kept in mind, however, for the conscientious caregiver. White or light-colored cats are susceptible to a squamous cancer of the nose and ears, especially when exposed to the sun over long periods of time. Either keep your kitty indoors or be sure to use a veterinarian-approved sunscreen on her delicate nose and ear tips.